Naked: The Best Way to Wear an AGV AX-8! 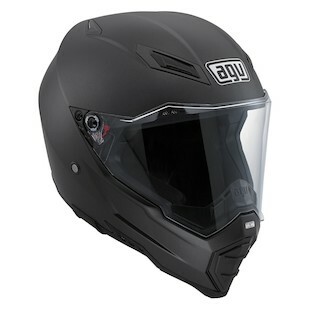 Offering a wide field of vision, a comfortable fit, and tons of ventilation, the AGV AX-8 Evo Helmet has been a success wide and far. Personally, it has been my go-to recommendation for customers as the feature list is high and the price point is comparatively low. What could you possibly do to this helmet to make it better? Why, take all its clothes off, of course! 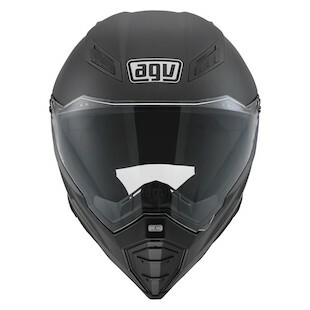 Stripping away all frills with a matte black finish, the AGV AX-8 Evo Naked Helmet is clean, mean, and super, super light! No really, AGV is calling the shell "SSL Carbon" -- which stands for ... you guessed it ... "super super light." Made from carbon, Kevlar and fiberglass the shell top-grade in protection carrying not only the obligatory DOT rating, but the ECE certification as well. Have you noticed the other piece of clothing that the AX-8 Evo has shed? Where did the peak go?! Removing the peak reduces drag and makes the AX-8 Naked more suitable for street use and adds stability at higher speeds. With the aerodynamics improved, we could see a much wider demographic of riders cleaving to this AX-8 and its birthday suit of glory. I honestly don't know why we haven't seen this trend before. It is a brilliant concept! 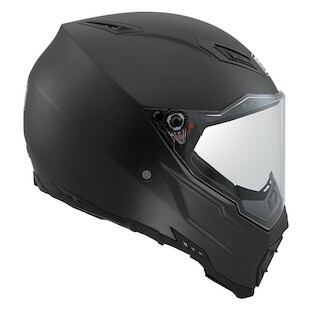 The added space in the chin area makes for excellent ventilation and leaves room for an extremely wide and tall face shield that supports goggles when desired. Removing the peak takes away any on-road handicap and alters the attitude of the AX-8, much in line with the trend in new dual sport motorcycles that I've recently seen. Appropriately priced, the Naked version of the AX-8 actually comes in under the standard version. After all, they took off the peak, and stripped back the paint. Why wouldn't they knock off a few bones while they were at it?